Lusters Scurl No Drip Curl Activator Moisturizer may be used daily to maintain and condition your curly hair style. It contains glycerine and vitamin B5, which together eliminate breakage and keep your curls, waves and natural hair soft, healthy and with a lasting sheen. This special "No Drip" Formula allows you to see S-Curl Activator and Moisturizer without fear of ruining your clothes or pillow cases. 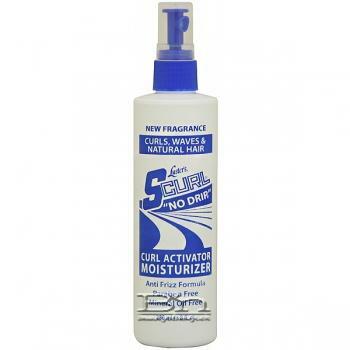 S-Curl Activator and Moisturizer can be used daily by the entire family and will not leave a greasy build-up. Direction: Hold bottle about 6 inches from hair, spray S-Curl Activator and Moisturizer evenly over the entire head, massage completely through, then style. Use daily to maintain proper moisture balance. For additional conditioning, apply Luster's Pink Oil Moisturizer Hair Lotion to hair and scalp at least 2 times a week to seal in moisture.